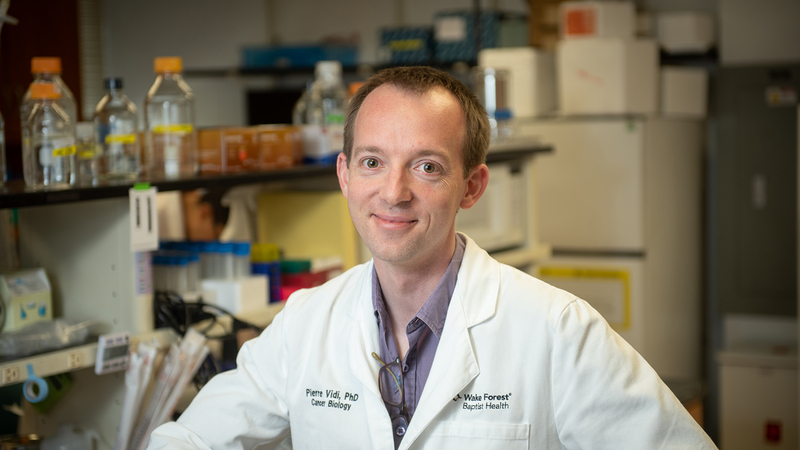 Pierre-Alexandre Vidi, PhD, is a cell biologist building three-dimensional culture models of the breast epithelium, with a specific interest in the role of obesity in breast cancer risk. His collaborative work focuses on the impact of cellular microenvironments on epithelial cell polarity and DNA repair efficacy, with the goal to develop preventative strategies for breast cancer initiation and progression. Vidi, a native of Switzerland, earned a master’s degree in cell and molecular biology from the University of Lausanne and a doctorate in cell biology from the University of Neuchâtel. He completed postdoctoral training at Purdue University, where he studied DNA damage responses in breast cancer initiation models. In 2015, Vidi joined Wake Forest School of Medicine to further research the link between DNA repair efficacy and breast cancer risk. Using biologically relevant three-dimensional (3D) cell culture models, Vidi studies the interplay of nuclear organization and tissue architecture in regulating DNA repair in human breast cells. He is specifically interested in obesity as a risk factor for breast cancer initiation and progression. He assesses the impact of obesity on cell polarity and DNA repair efficacy, with the goal of identifying preventative strategies for breast cancer. Notably, through a grant from the Department of Defense, he studies the impact of weight loss and exercise interventions on reducing breast cancer risk, using a mouse model of diet-induced obesity and 3D cell culture systems. In partnership with Purdue University, Vidi is co-inventor of a recently patented breast-on-a-chip device that reconstitutes the curvature of mammary ducts for the study of biological processes and therapeutic drug effects. His industry partnership capabilities include unique expertise in cell culture systems and cells biology processes for breast cancer screening, assessment and prevention.